AQURON SUPERGRIND SYSTEM utilised the AQURON 1000 internal concrete hardening and curing assistance in the concrete, followed by CRETEPOLOISH MAX applied after the diamond honing process. AQURON SUPERGRIND SYSTEM can be utilised on new or existing concrete to produce a professional sheen diamond grind polished concrete surface. . AQURON SUPERGRIND SYSTEM is a longterm solutions for sealing polished concrete, and with regular cleaning “the more you use it, the better it gets”. 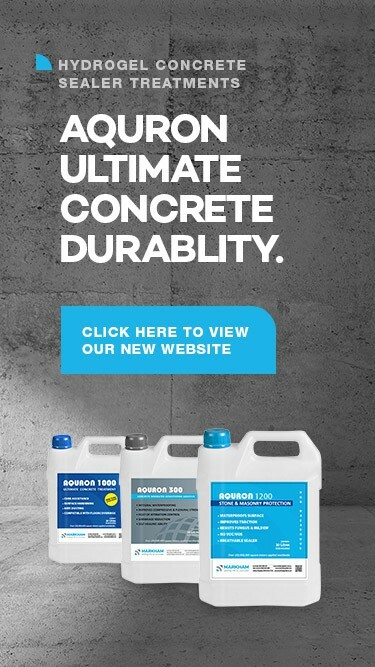 The concrete-aggregate slab is firstly treated with AQURON 1000 to form an insoluble calcium silicate gel within the concrete. This provides an important base for the best sheen results. The slab is then diamond honed after at least 7 days of having the AQURON 1000 treatment applied. As the honing progresses, the AQURON 1000 treatment leaves the surface of the concrete polished with a high sheen. For an even better sheen result, and stain resistance apply CRETEPOLISH MAX. We recommend the surface is scrubbed clean after final honing/polish, then first coat applied diluted with water 1:1 followed by subsequent coats undiluted. High speed burnishing will increase the gloss levels and stain resistance. MARKHAM GLOBAL Australia's team is here to help with any questions as to how AQURON SUPERGRIND can be best utilised in your project.